Have you seen the craze that’s sweeping the crochet world? Colour pooling is a clever way to manipulate short colour repeats in variegated yarn… Anna Nikipirowicz is here to show you how! 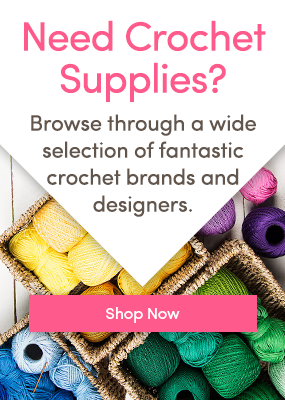 Planned yarn pooling has been taking the crochet world by storm! I’m sure most of you have come across the gorgeous Argyle patterns and wondered how they are done – well wonder no more, I shall take you step by step through creating your very own gorgeous Argyle pattern. Tension – you will need to change your tension from tighter to looser throughout your work, easiest way to achieve it is to swap between different hook sizes. You might need few attempts to get it right – don’t get discouraged if the pattern doesn’t form at your first try, keep going, your efforts will be rewarded. Yarn – this is the most important part, and we’ll talk about it further below. Yarn pooling works best when done using moss stitch (also known as linen stitch) which is done over an even number of stitches – and the amount of chains you will start with depends on the yarn you use. So let’s talk about the yarn – the success of yarn pooling depends on the correct yarn. It of course has to be variegated, but the yarn has to have a consistent colour repeat and consistent lengths of colour, between 15 and 38 cm (6 to 15 in) – anything longer or shorter than that and the pooling will not work. The changes of colour have to be clear, for example, with the yarn I’m using, Bernat Softee Chunky Ombres in Nature’s Way (29012). You can see the colour changes and they are all roughly the same length. I have 4 colour repeats in my yarn: blue, brown, cream and beige. Row 1: double crochet (dc) into the 4th chain from hook (counts as 1 dc and ch-1sp),* chain (ch) 1, miss one ch, dc into the next ch. Repeat from * to end. Row 2: Ch 2, dc into the first ch-1 space, ch 1, miss one dc, dc into the next ch space. Repeat from * to end. Repeat Row 2 until your work is as long as you need it. Below: I have subtracted 1 dc and 1 ch by pulling them out from the end of the first row – alternatively you could add 1 ch and 1 dc it will work just as well. I am now on the beige shade. But that is not what I want, I need them to shift by one stitch so: I want 1 beige, 3 blues with one of the blues falling directly above the brown. To achieve it I need to go back to the beginning of my row and really tighten the stitches so I will get the correct colour sequence. Just by tightening my stitches I have achieved the correct colour placement I need to form the Argyle pattern. Now my blues are in the correct place, I want 3 browns with the last brown being directly above the cream. During colour pooling you will constantly have to tighten or loosen your tension to bring the correct colour placement through the stitches, so that the colours lie in the correct place to form diagonal lines. I can now continue repeating row 2 of the moss stitch but paying attention to the row that is two rows below to see if the stitches are being placed in the correct order – if they are, the gorgeous Argyle pattern appears! Have you tried colour pooling? We’d love to see your pictures! Share them with us on the Community page! You mention dc, I thought moss stitch was all sc and ch 1? We have the crochet terms in UK, US, Dutch, and French terms – each differs slightly in names for the stitches. Which terms are you using?